You are at the wedding of a good friend. Picture yourself following behind the newlyweds as they hold hands and walk down a path or roadway away from you. You and all their other guests, their significant family members, and friends, are following behind the couple. Consider yourselves travelers on the road we call ‘life’ – offering friendship and support to the happy couple. As time passes people will come and go naturally in the group of friends. Changes to the group are normal as friendships wax and wane. Now picture the couple becoming angry at each other, dropping each other’s hands and walking towards different sides of the road. This action represents, in my analogy, the initial marriage breakup and separation. As the couple becomes separate entities, the road gets wider and starts diverging. Now single, they can each choose their own direction. As the friends and family of the couple, following along behind them, where will you walk? Who will you follow? Will you hesitate and stop following? Initially most good friends and family try to stay in the middle of the road. This is a difficult place to be as the road widens. What kind of friend are you? Where would you walk and how would you behave? Let us examine the available choices. History, values, beliefs, and interests will all impact how you behave. 1. Middle of the Road: Friends stay unbiased and keep both friendships. Remaining friends with both parts of a couple is difficult in an acrimonious separation and divorce but easier if things remain amicable. Good friends try to remain fair to everyone and do not judge. This is not an easy path to take or stay on, but wonderful for the long term if it is doable. Often if asked to step to the side of one ex-partner, these friends will change into the other ex-partner’s lane as they feel their wish to be friends with both has been dishonored. 2. The Lane Change: Friends pull to one side to support ‘their’ friend. Old pre-couple friends, some individuals, and couples will start to step to the side of the road of whom they want to support or stay connected with. Separation and divorce can be polarizing, especially if it is not a mutual break-up. People may take moral sides or just prefer one person of a couple. Sometimes one ex-partner may not want to maintain friendships and may ignore or rebuff friends offering support. They do not want to justify their decisions or be judged and may not value friends at the time of the split. (Spoiler alert – this is often regretted later.) Thus rejected friends may end up changing lanes and remaining friends with the more receptive ex-partner. Family members are often pressured to be on one side only and, although painful, this is not necessarily personal. Family may not always choose family, especially if put under pressure. Judging one ex-partner to be ‘in the wrong’ will make some choose sides swiftly. 3. The Slow Down: Friends take a wait and see approach. Some friends may become scarce. These friends do not want to put in the energy during hard times. They may be fair-weather friends who do not stick around when the environment is not all sunshine and roses and they may show up again when the sun returns. There is some social stigma attached to being single. Couples and single people have different interests so some relationships will change, as they just do not invite their single friends to couple activities. Seems unfair, which it is, but if they feel uncomfortable the new single may feel uncomfortable too. 4. The U-Turn: Friends decide to turn around and walk away. Divorce is a difficult thing to watch and some friends do not want to deal with it or do not know how to deal with it. These friends may be there at the beginning but vanish when things get difficult. Insecure couples fear a breakup may be contagious and see a newly single person as a threat. The less secure their marriage, the more uncomfortable they will be and the faster they may disappear (ref: Rebuilding When Your Relationship Ends, by Dr. Bruce Fisher and Dr. Robert Alberti). Culture or belief systems in some do not allow for marriages to end, so these friends will quickly judge their divorcing friends and walk away. 5. The Ditch: Friends that disappear. Some friends, hearing of your separation, immediately ditch you and vanish into thin air. They have no contact with either you or your ex. These people may just feel uncomfortable. Do not take every lost friendship personally. Other people may be having personal issues and avoiding friends in general – not just the separating couple. We never know what is happening in someone else’s life or mind. Let friends go as they choose. They will return on their own time if your friendship is meant to be. 6. The Swerve: Friends veer back and forth supporting no one. Some ‘friends’ pump each ex-partner for negative information, badmouthing their ex-partner to encourage more. They then either tell everyone that will listen all the personal details that were not meant for public consumption and worse, they may then take the info back to the ex-partner and play the couple off against each other. This behaviour can do major damage. I discovered some of this happening during my own separation while comparing concerns with my ex. These ‘friends‘ were immediately no longer friends with either of us. A few friends may intensify their friendship to get a closer look at the damage caused by the breakup. When the ‘accident scene’ is cleaned up and everyone has moved on, they will be nowhere to be found. Seeing other people suffering makes them feel better about their own lives. Each ex-partner usually does deserve some support. Life can be slightly easier during a divorce, for everyone involved if both partners keep some supportive friends. You should be grateful when this happens, even if it means losing some friends. Loss of friends and family is really is a sad reality of a separation and it should not be viewed as a competition. Try not to take it personally. You may not have much to do with some decisions friends make. Time often makes it easier to be at least friendly acquaintances with the friends that went with your ex-partner. If you have children you will probably run into them occasionally. The upside of separation and all the change is that new friends will appear that will have no investment in the past. This new friendship can be less complicated and be a release from the tensions of friends that are invested in the past. Part 1: How to Maintain Good Friendships During a Separation – Part 1: Advice for the Supporting Friends. Part 2: How to Maintain Good Friendships During a Separation – Part 2: Advice for the Supported Friends. If you are having trouble managing your separation, or are worried about a friend or family member, please contact me. I do offer a complimentary strategy session. Please call, or email, so we can discuss how you, or your friend, can benefit from coaching. Your Divorce Coach in Dundas! 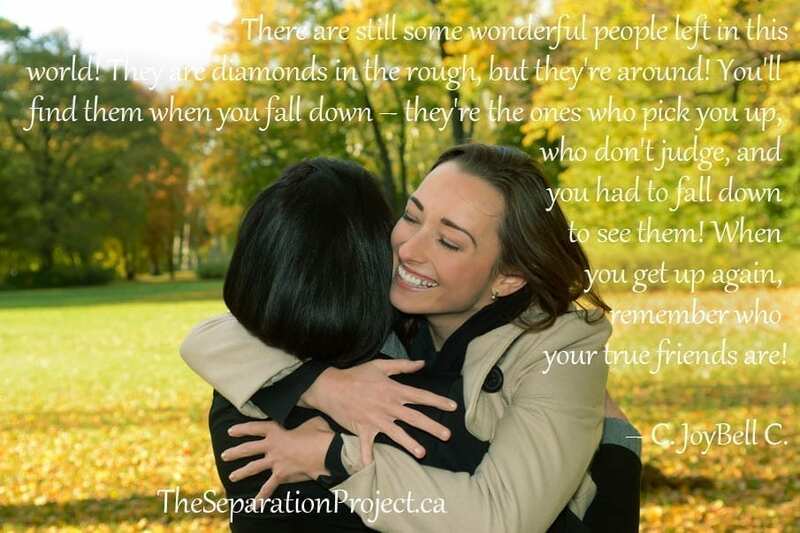 How to Maintain Good Friendships During a Separation – Part 2: Advice for the Supported Friends. 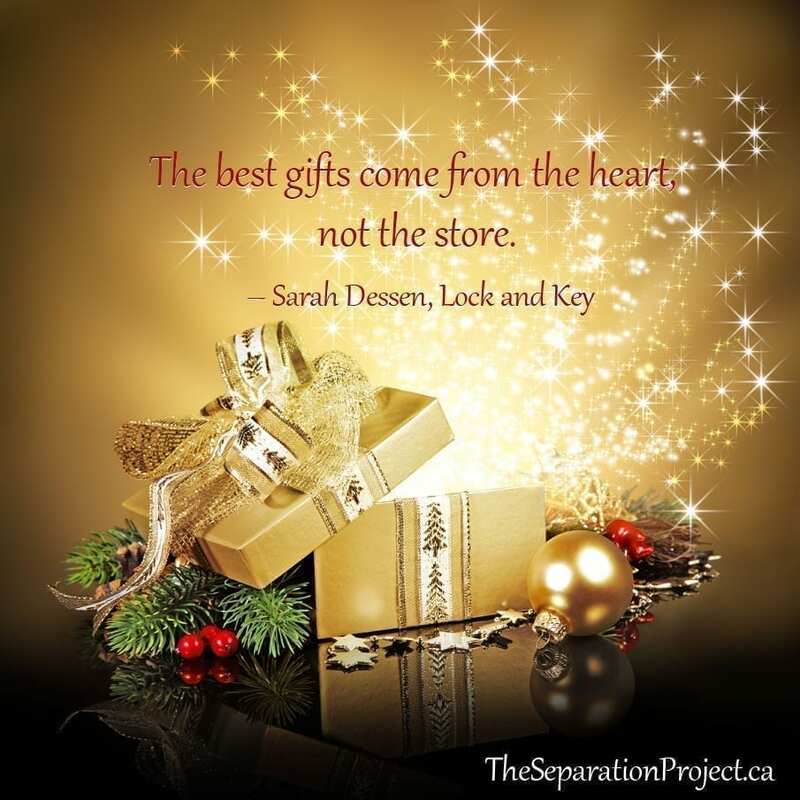 When you go through a separation, you may not be prepared for the loss of relationships with friends and family that takes place. These devastating losses, at an already difficult time, can be quite shocking. The losses may not be immediately apparent but can add up over time. If you are going through a separation try to keep your true friends. Often separating people cut themselves off from friends inadvertently when their coping abilities are at their worst. Here are my suggestions to make it easier to maintain the true friends you want to keep. If you know what you need, tell your friends upfront what would be most helpful to you. If you want to hear advice, let your friends know any ideas and feedback are welcome and appreciated but do not pressure them. Listen respectfully to any suggestions and thank your friends. Tell them you appreciate their ideas or advice, but will do what you feel is right for you. If you prefer not to have advice, and you are receiving it, let your friends know that you are not ready to listen to feedback. Be assertive if you do not want to talk about the situation at all and friends are asking. You do not owe an explanation of your situation to anyone. Talking about your issues can be helpful to work through your emotions but choose whom to confide in carefully. If confidentiality is important to you, make sure it is also important to those you share with. Be aware that some ‘friends’ may just be there to collect the scoop. Do not feed their appetite for gossip unless you want to be gossiped about. Know that what you say may come back to bite you, so keep your words as positive as possible and speak with integrity. ‘The Four Agreements’ by Don Miguel Ruiz is a good read as it offers a powerful code of conduct. Respect the limits your friends may have for dealing with your separation. If friends are trying to remain unbiased to both you and your ex-partner they may not want to hear any bad mouthing. Respect this. Unloading your emotions on friends that are not sure how to handle it can make things uncomfortable. Be sensitive and respectful. Do not take it personally if friends do not want to hear much about your situation. Be respectful and let them distance themselves if they need to. Do not keep repeating the same things to friends. Try to discuss issues once, then either do something about it or accept it and move on. Acknowledge your role in the separation and take responsibility for it. Fault always lies on both halves of an ex-couple but this fact sometimes takes a while to sink in. No one is perfect. Your friends will respect your mature view of the situation. Playing the victim may be good for some initial attention. The sooner this stage is done the better for everyone. Few true friends enjoy a pity party for very long. Look after yourself. Your friends want to see you coping as best you can. See my recent blog on self-care for some ideas. Keep your sense of humour and adventure! Share laughter with friends at every opportunity. Things may be pretty amusing even in the worst of times if you can laugh at yourself and your situation. My own separation was full of amusing ironies. Push yourself to accept invitations for fun activities with friends. You will feel better for the change of scenery. Make your own decisions. This is your life and you alone will own the consequences of the decisions you make. Be grateful if you have true friends in your life! Appreciate what your friends do for you and with you! Nothing is better than a heartfelt “thank-you” for a true friend that has been there for you. Also remember that friends constantly come and go in your life for many reasons, not just a separation. Your true friends will still be at your side long-term through the good times and the bad. These are the friends worth keeping! If you are having trouble managing your separation or are worried about a friend, please contact me. True friends quickly become apparent when navigating difficult times. They are the ones that offer support when it is truly needed. People often ask me what to do to help people going through a separation, as they feel helpless. To be a good friend to someone going through change can be challenging. It can take a lot of energy and time to support people during a breakup, but true friends always know their investment is worthwhile. Difficult times are usually temporary and good friends can last a lifetime! Here are some of my ideas for people trying to be supportive as someone goes through a separation. The best thing you can do is simply be present. Show up and be there. If they don’t seem to want anyone around, respect that, but don’t forget them. Call and check in on them and give them time to work through things on their own if this is what they want. Listen if they want to talk. Listen with empathy and compassion. Walking and talking is a great activity. Do not judge. Try and remain open and understand their perspective. Before you start offering suggestions or solutions, clarify if they are welcome. Sometimes people do not want advice. They just want to be heard and are not ready to listen. Include them in fun activities; take them out and find distractions to ease off some of the stress and negative energy. Activities with other people are great at taking the focus off the situation and creating some much needed positive energy and relaxation. Pitch in if you see things need doing. Do the dishes. Cut the lawn. Babysit or take the kids out for, or with, them. Allow them time to grieve and gain perspective. Ask how you can help. They usually know what they need from you. Remain honest and voice your thoughts and concerns with respect and compassion as suggestions. Do not tell them what to do. Respect their choices even if you do not agree with them. It is their life, not yours, and the decisions are theirs to make. Please let me know what you did to help a friend in crisis in the comments below. I do offer a complimentary strategy session. Please call or email so we can discuss how you, or your friend, can benefit from coaching.